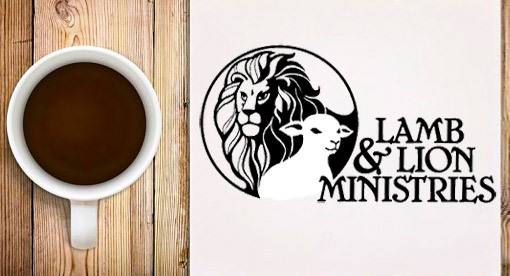 On Day 9 of Lamb & Lion Ministries 2009 Israel Tour, we delved deep into the sorrows that lie in the back of every Jewish mind. We visited the cemeteries of the great statesmen who helped make the nation fulfill it’s prophetic destiny, and mourned with them over the Holocaust that made the nation come to life. 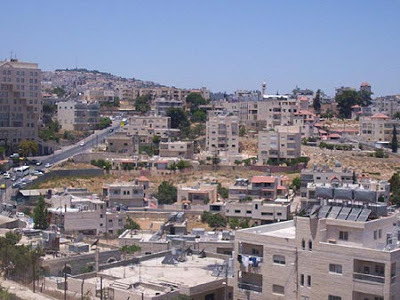 We had another opportunity to delve into Palestinian-controlled territory, nervous about what kind of greeting we’d receive from the other story that dominates the news concerning Israel. We entered armed with only dollars. 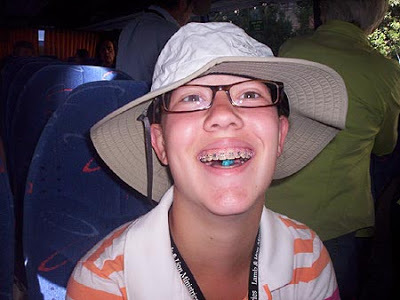 Half the fun is in getting there, as Katie demonstrates for us on the green bus. 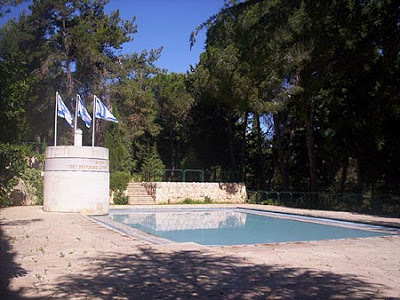 Theodore Herzl, the Father of Israel, is buried in Herzl Cemetary, along with the many famous names of Israel. I put a rock on his grave in memorial, the Jewish custom of remembering and honoring the deceased. 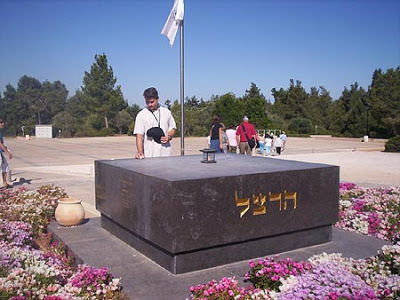 This display is the Israeli equivalent of the U.S. Tomb of the Unknown Soldier. It’s made to look like a lost submarine. 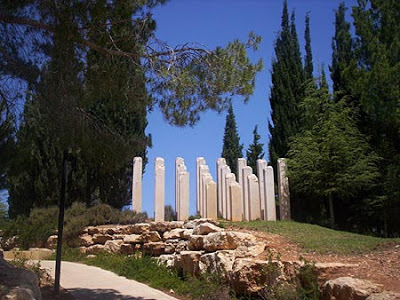 We next visited the Yad Vashem Holocaust Museum, where architecture, print and video tell the true story of the Holocaust. Pictures are not allowed indoors so as not to disturb people. Outdoors, this monument is for the youth cut off in their prime before their full potential was every realized. 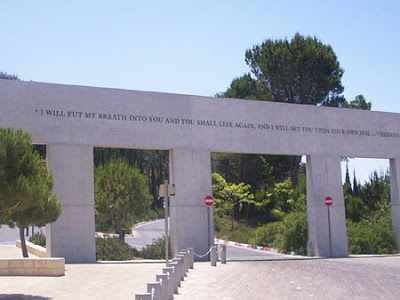 Most people leave Yad Vashem visibly moved. 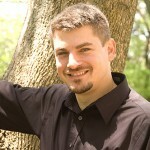 “I will put my breath in you and you shall live again, and I will set you upon your own soil” (Ezekiel 37:6). 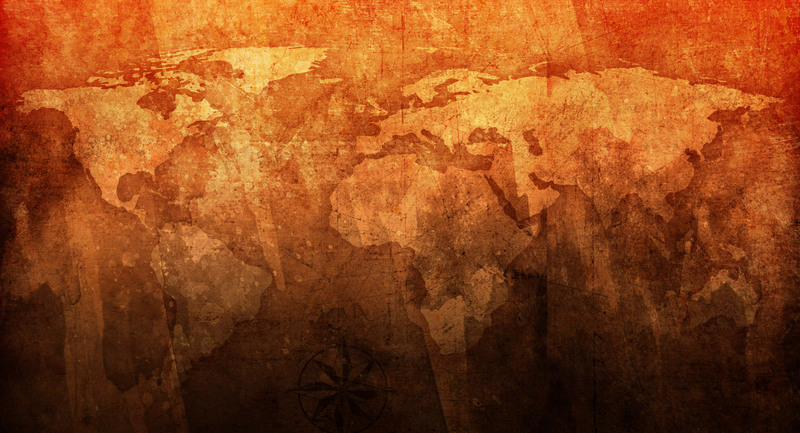 The world may wish to wipe out the Jews, but God’s promises stand unmoving. “O, little town of Bethlehem.” Not so little anymore at about 40,000 people. 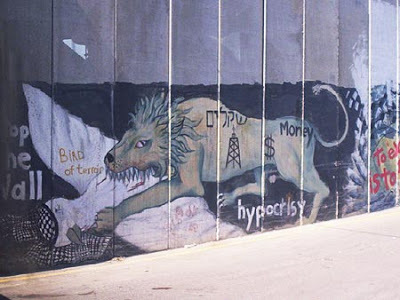 The Palestinians now control Bethlehem. 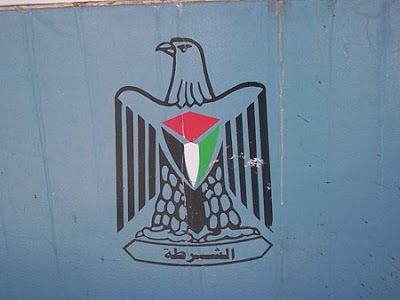 The symbol of the Palestinian police. They were nice young guys who serve to protect the tourism trade. 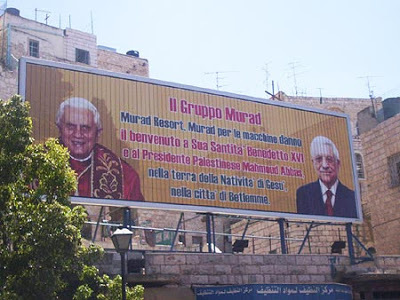 Pictues of the Palestinian leader Abbas are everywhere, this billboard with the Pope. 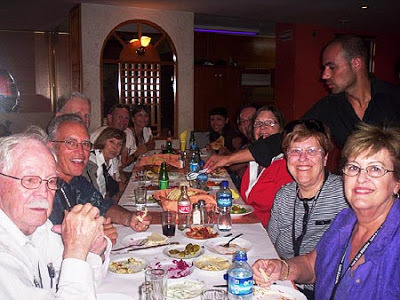 The red bus enjoying their Palestinian cuisine. 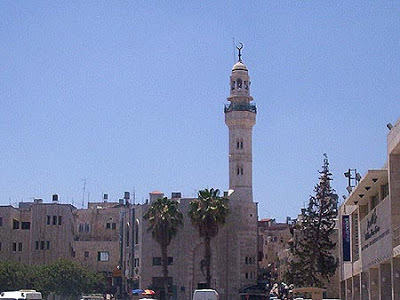 Being Palestinian controlled, Bethlehem Christians have fled in huge numbers. The Christian population went from near 80% in ten years to near 20%. The remaining Christians live under a mafia-like protection racket. 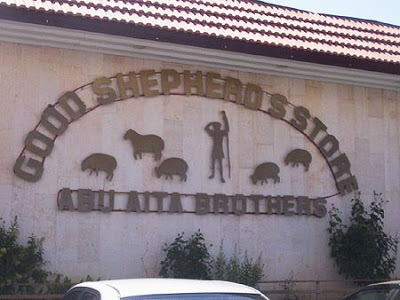 This Christian gift store has the most beautiful olive wood and jewelry pieces. Tourists are the only customers Bethlehem Christians can expect. 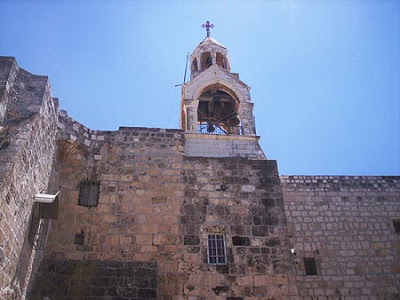 The Church of the Nativity is the only church left standing that dates back to Constantine’s time near 300 A.D. 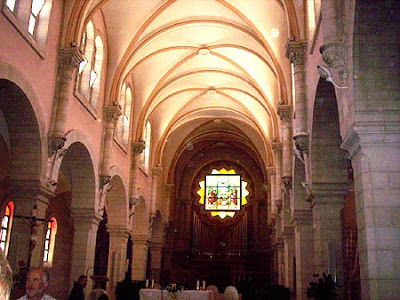 The newest of churches built on older churches, this sanctuary is magnificent to behold, full of old and priceless works of craftmenship. 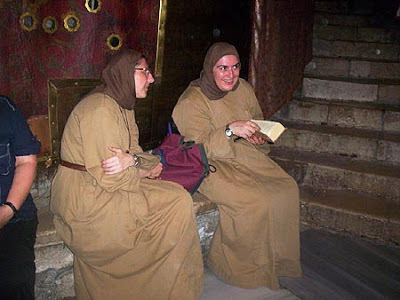 Nativity nuns go for the milk chocolate brown habits. 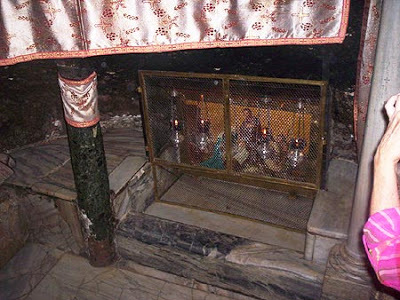 Supposedly, this is the manger Jesus was layed in… assuming Bethlehem animals ate out of marble-covered troughs. 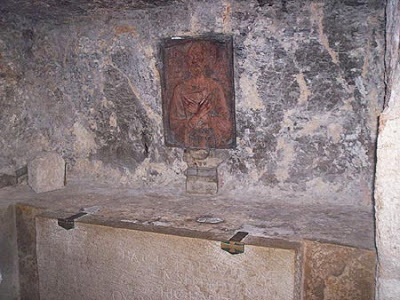 Jerome, the 4th Century scholar who gave the world the Latin Vulgate (yes, there was something before the King James version), holed up in here for 24 years alone working and was buried in his cave under the church. The bones have since been moved. 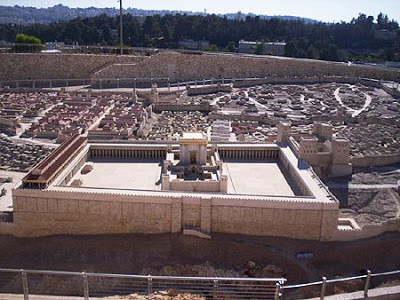 The Israeli National Museum has the biggest model of ancient Jerusalem. People can peer back into Jesus’ time and see what the city looked like then. 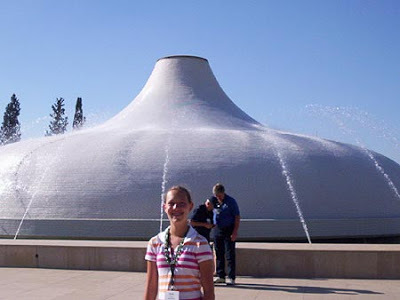 The Dead Sea Scroll Museum roof is meant to look like the pot lid from a scroll jar. It’s water-cooled as there is no air conditioning inside. Many pieces of the original Dead Sea Scrolls not traveling on display are held here, pieces of the Old Testament that prove the Bible is as accurate today as it was 2,000 years ago. Should a nuclear bomb hit Jerusalem (and one never will), the scroll vault drops into a protective bomb shelter. Hamas must train their street merchants, the most pushy and hostile gauntlet of salesmen I’ve ever experienced. Muslim women can look hip, too, with the most ornate head scarves and colored robes. If I see another gaudy gift shop I’m going to hurl. Every Jew today will tell you concerning the Holocaust “never again.” The slaughtering of six million people merely because of their race is a renching experience to remember. And yet, we must, for the Holocaust of the Jews will happen yet again according to Bible prophecy. 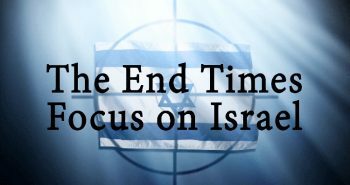 Revelation 12:13-17 and Zechariah 13:8-9 fortells that during the last half of the upcoming 7-year Tribulation, the Antichrist will pour out his anti-Semitic anger against Israel, annihilating two-thirds of the Jews (that’d be 8-12 million today), making those remaining who are able to flee to the dessert fortress of Petra. God will supernaturally protect them with Michael the Archangel, though, and many of them will accept Jesus as Savior, joining the Tribulation believers of that age (Zech. 12:10, Rom. 9:27-28; 11:25-27). Another Holocaust horror will turn instead in the end to a blessing to the Jewish race, for they will finally know and accept their Messiah – Yeshua (Jesus), the Son of God. Tomorrow for Day 10 is a free day, open to explore wherever our whims may take us. 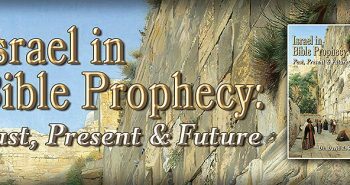 Until I report on those events, learn more about the Jews in end-time Bible prophecy. 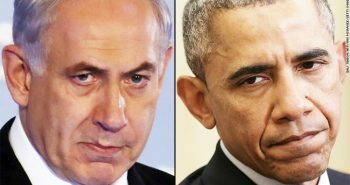 What is the feeling among Israelis concerning the re-election of Ahmed in Iran? 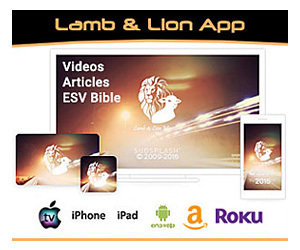 I think that this could be your last trip to Israel before the Lord returns for us. "One dolla dis. Four for ten dolla. No? Five then. Where you going?" 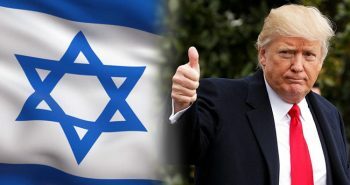 For the question about Iran, the Jew will answer "the Romans have come and gone, the Nazis have come and gone, yet the Jews are still here." …the Jew will answer "The Romans have come and gone, the Nazis have come and gone, yet the sellers of cheap junk are still here. We can't get rid of them!" 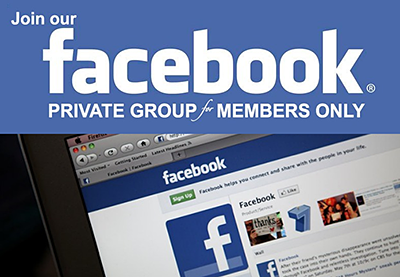 Got that right, Jay S – lol! As crazy as it sounds-the animals troughs were actually and correctly made out of marble/stone at that time. It was very plentiful and common.